Desolate. Barren. Unforgiving. 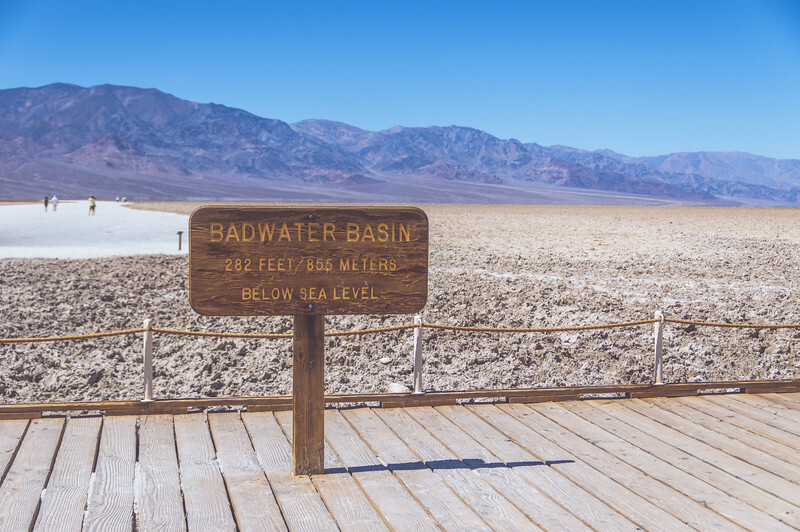 These are just a few of the words that pop into mind as you look out over Badwater Basin, the lowest point in the continental US. 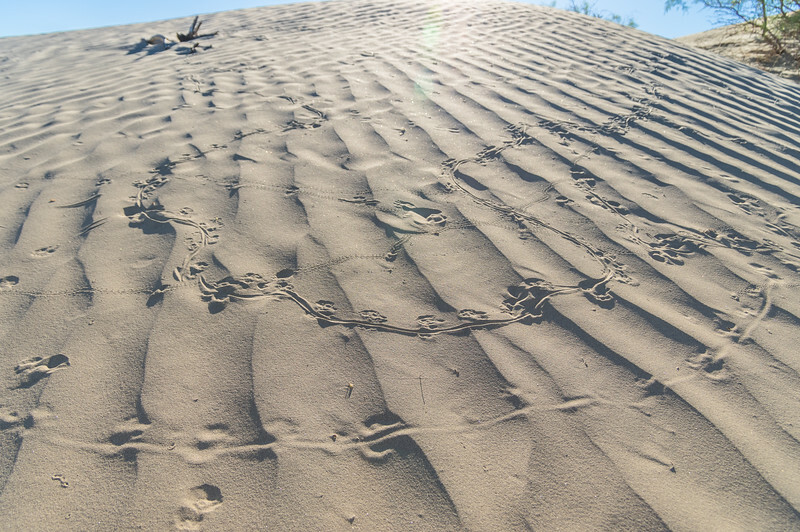 The parched patch of land shows little signs of life, yet it teems with tourist like us. 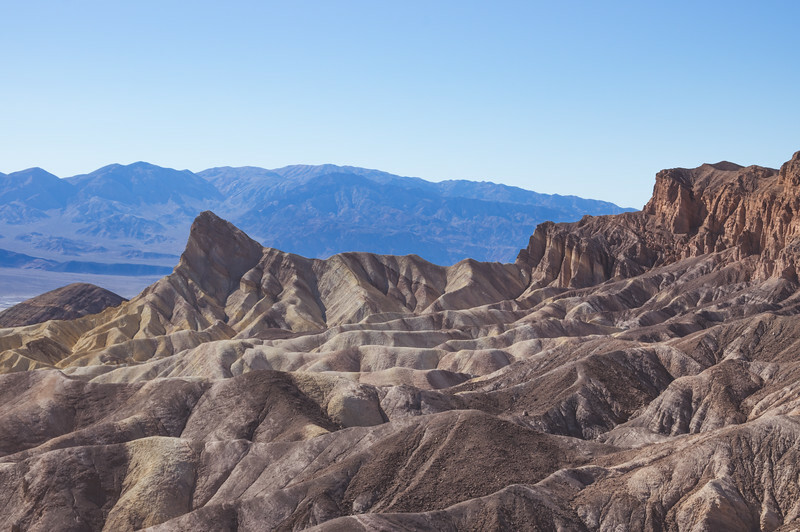 It’s only one of the many Death Valley attractions I visited, all of which left me in awe of the beauty and majesty of one of the most visited national parks. 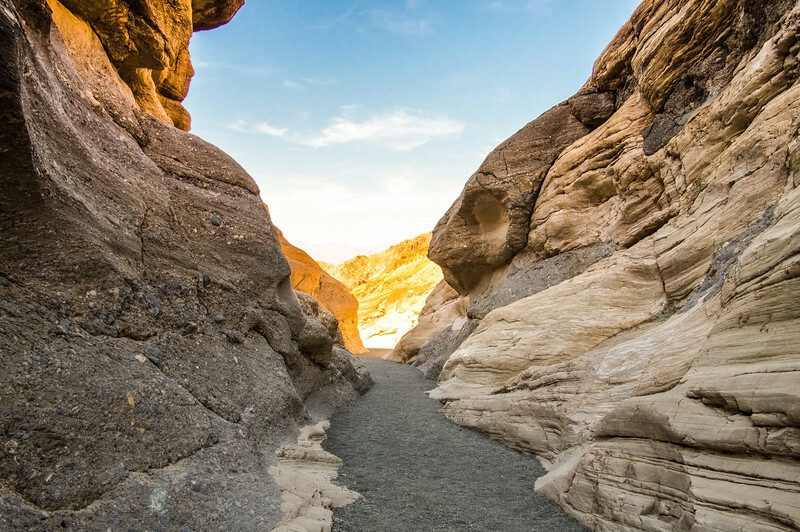 Now you can use this Death Valley guide to plan your own trip to the desert! 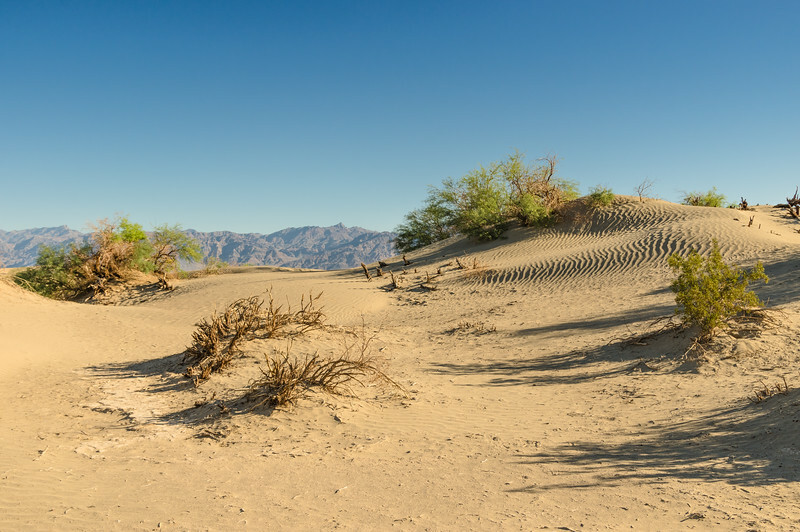 My friend and I arrived in Death Valley National Park around noon after a brief night in Ridgecrest visiting family. We decided to make a stop but could have easily driven straight from Los Angeles to Death Valley. 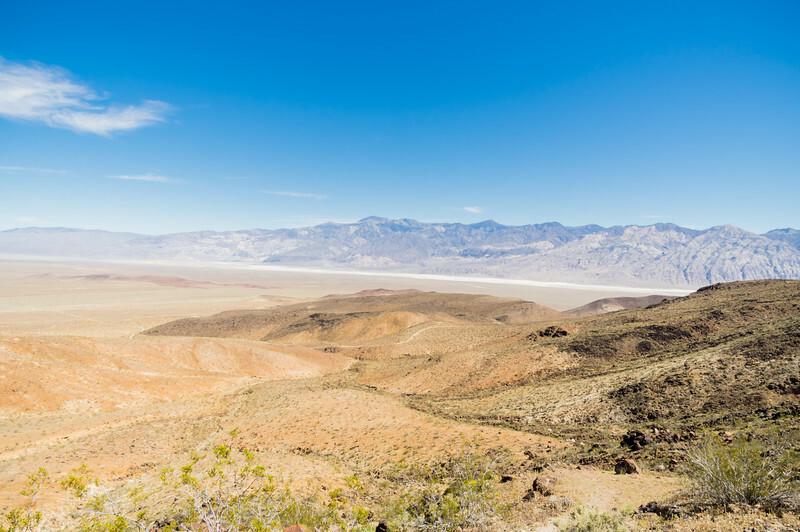 Headed up Hwy 178 we noticed the land arid earth climbing, signaling our climb into the mountains surrounding Death Valley had begun. Cell signal was patchy, as were the homes and businesses as we approached our destination. Suddenly we found ourselves at a crossroads. 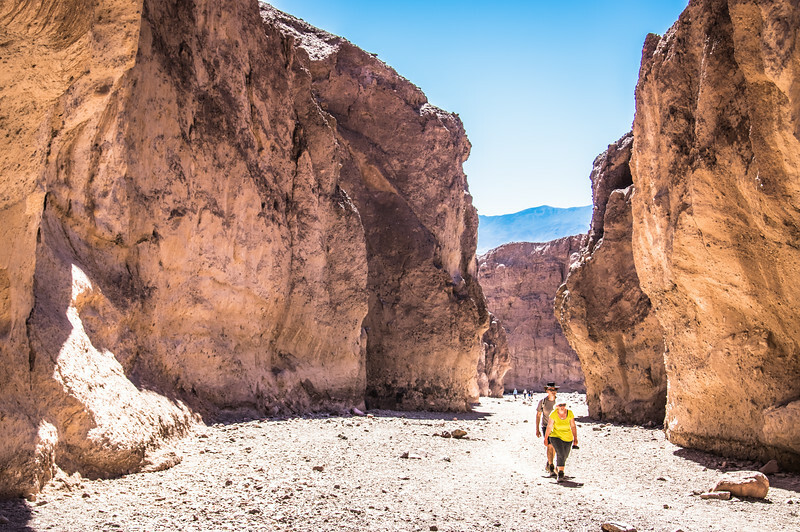 Hwy 190 was our gateway to Death Valley, but we weren’t quite ready to descend into the furnace below. First a quick hike! fyi...all images in this post were created with this gear! 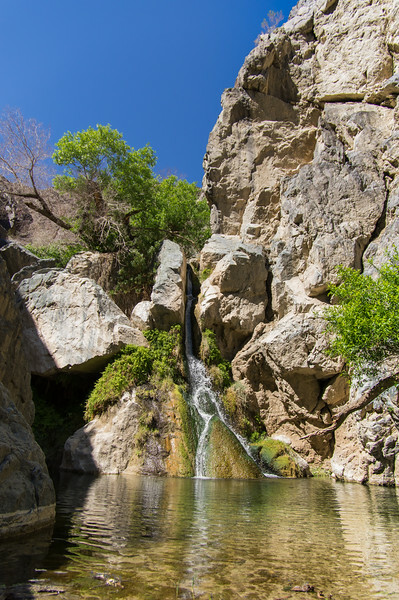 We headed West on 190 toward Darwin Falls, our last oasis before the desert. Along the way, we passed Panamint Springs, one of three hotels located within Death Valley National Park. Relieved we hadn’t booked our stay there, we pumped the car full of gas and continued west. A small sign along the road pointed out the way to Darwin Falls, a quick 1-mile hike. 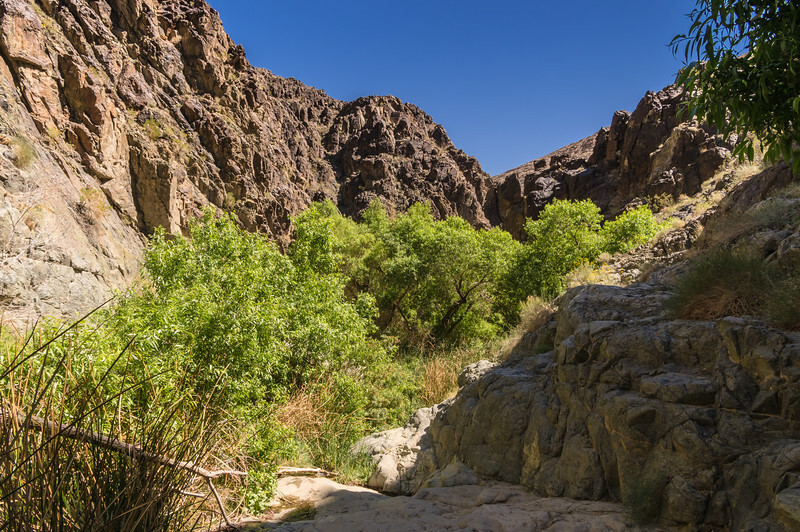 The terrain was rough, as much of the hike is in a dry creek bed filled with rocks and narrow channels. 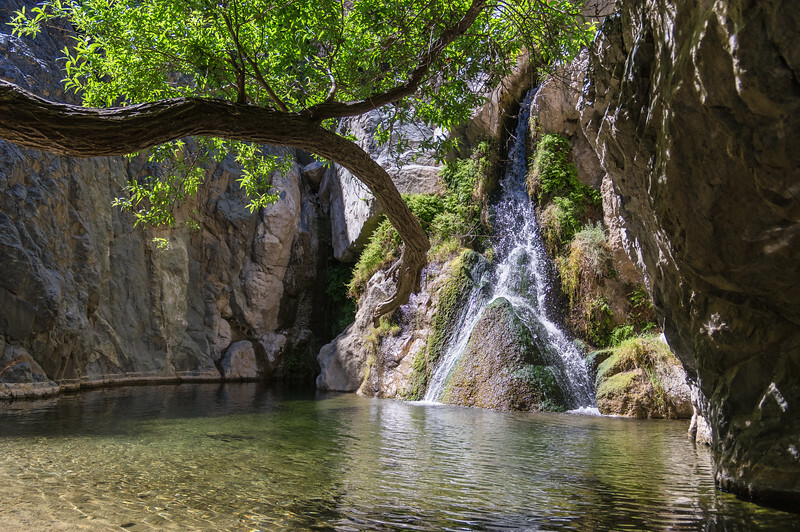 Foliage and the sound of trickling water lure you further despite the scorching heat. 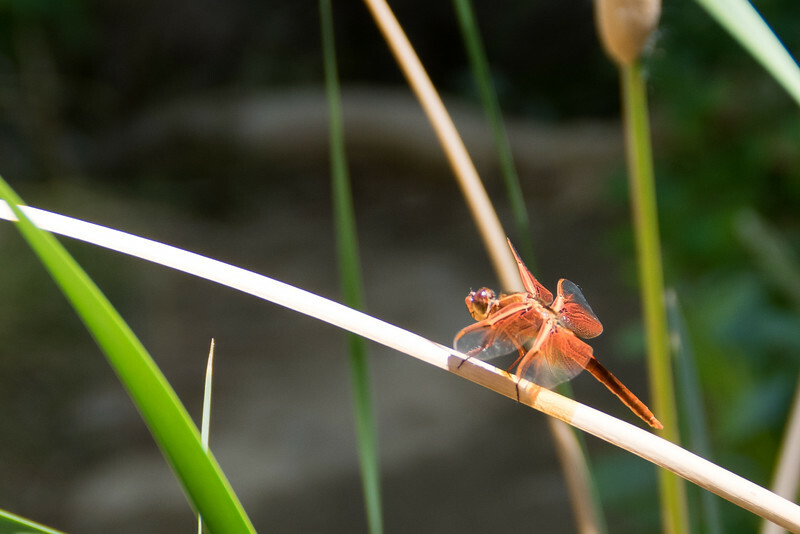 Finally, we emerged at an emerald green pool where we watched dragonflies flitter across the surface of the cool spring water. Refreshed by the shade, we headed back to the car eager to find out what other Death Valley attractions we could find that afternoon. But before we made the final descent, we ventured further West to the Father Crowley Overlook, a vista point along Hwy 190. We joined several other groups of travelers for a quick gaze at the distant valley below. All stood still while marveling at the rock formations. Hawks soared above, crying out from time to time as if to warn us. A quick snack and bathroom break (portapotty) later, we were on our way. My little Honda hugged the road which snaked through the mountains that surround Death Valley. Finally, we began to descend into the valley. As the road leveled, we passed a few signs warning of the lack of service for the foreseeable future. Radio failing, we cranked up the MP3 player and kept driving. 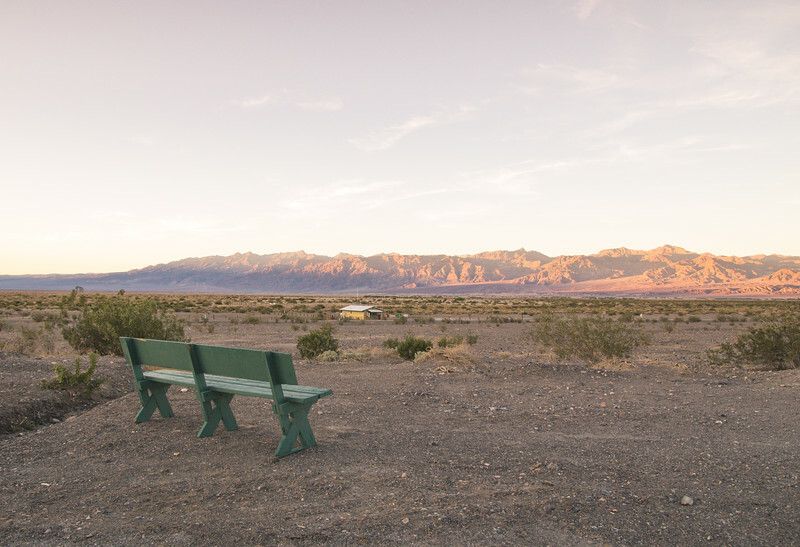 Eventually, we arrived at our lodging, Stovepipe Wells Village Hotel. An abandoned truck, a wagon wheel, and a general store were the first clues we’d ventured back in time to 1950’s roadside Americana. After checking into our comfortable (well air-conditioned) room, we decided to head out for one more hike before the sunset. 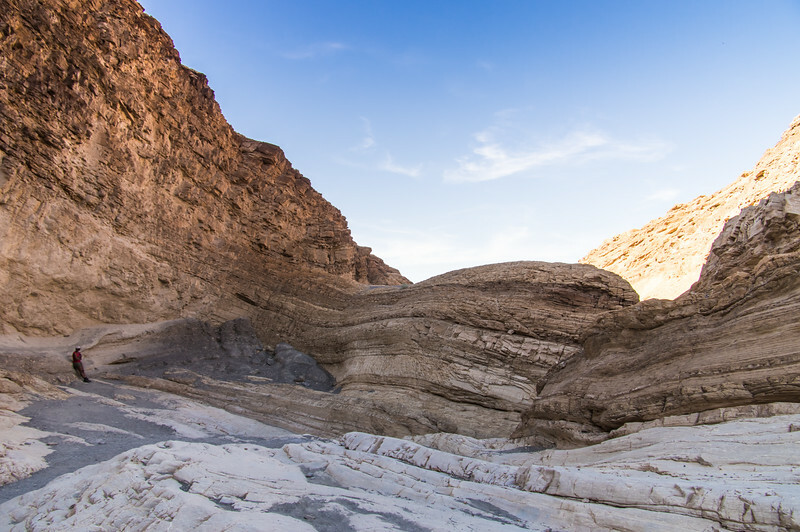 Luckily, Mosaic Canyon was only a few miles drive from the hotel. 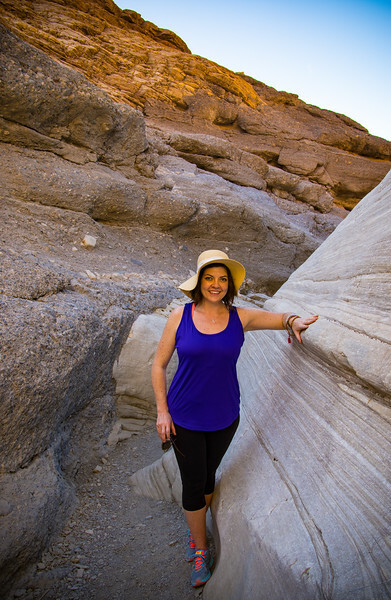 The smooth surface of the towering rocks lining the path of Mosaic Canyon seemed altogether different from the rocky creek bed we’d walked that morning. Long shadows and golden light played tricks on our eyes as we ventured further into the canyon. We took our time exploring as the sun crept slowly down. Concerned we’d run out of light, we finally decided to turn back for the car. We watched as the sunset from a small bench near the parking area, taking in the scenes of the valley below. This would be our home for the next few days. After a brief rest and cold shower, we wandered over to Toll Road Restaurant, the premier dining establishment at Stovepipe Wells. The dark, cool interior was a welcome haven after the day’s brutal sun. A quick glance over the menu was all we needed, neither in the mood to nitpick. Barbeque ribs for me. Grilled chicken for him. A couple of beers. All was good in our world. 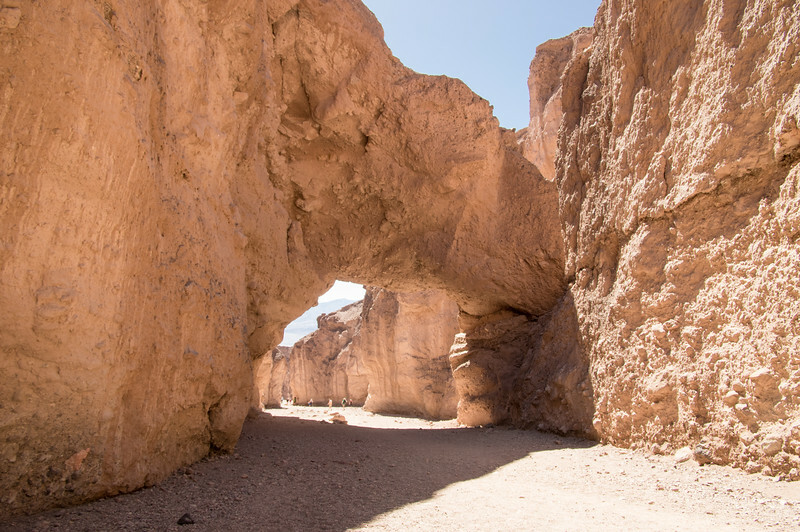 The next morning, we rolled out of bed eager to see more of the many Death Valley attractions on our agenda. We rushed out of the room to catch the early morning light at the nearby Mesquite Flat Sand Dunes. Wanting to get as many photos as possible, we parked the car in the lot and set off on foot. 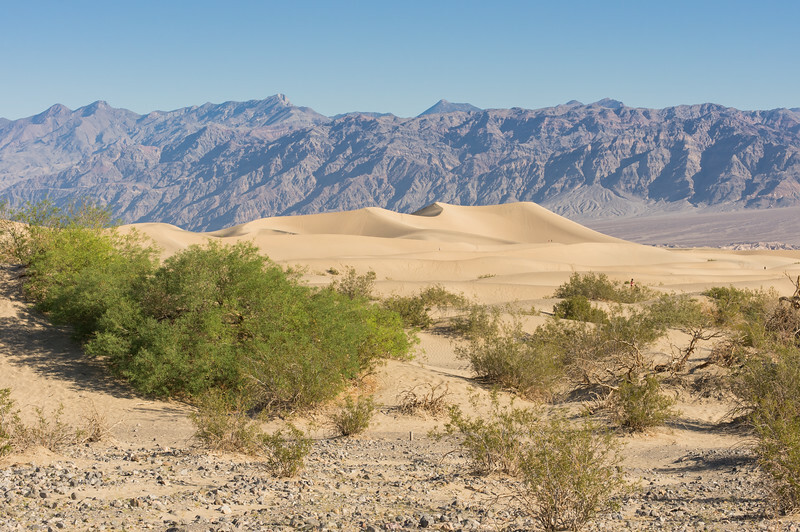 These dunes are one of the most frequently photographed spots in Death Valley, though they aren’t very big at all. 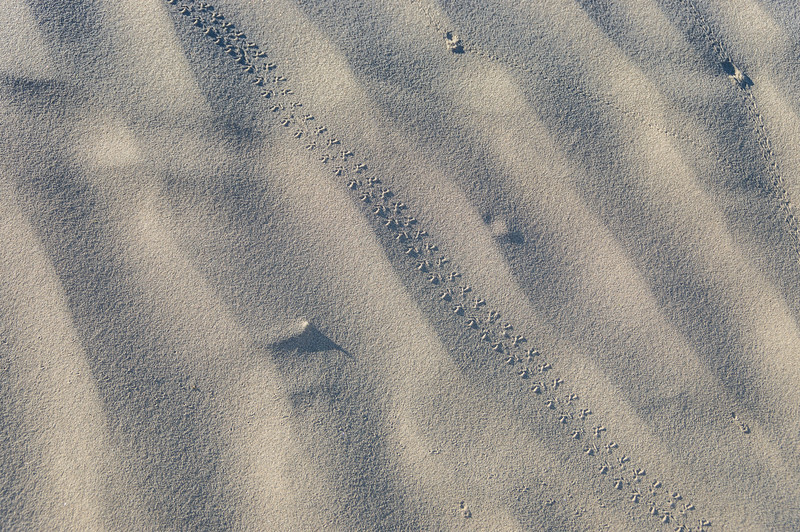 The powder-fine sand shimmered in the early morning light. 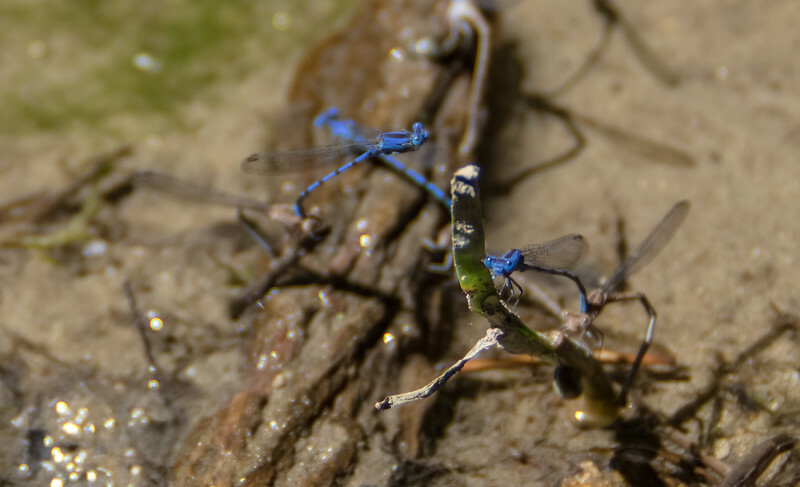 Signs of life were visible despite the oppressive heat. 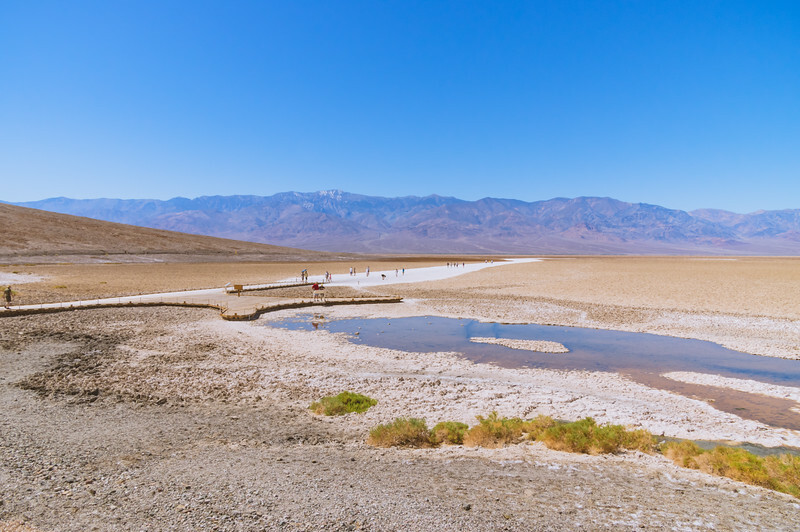 Next up on the agenda was Badwater Basin, the lowest point in North America. We knew we needed to visit as soon as possible to avoid the hottest part of the day. By the time we arrived cars were already filling the lot as tourists, like us, ventured out onto the dry, cracked earth. Standing in the shadow of neighboring Mt. Perry. Signs send foreboding messages, warning visitors of the risk of heat exposure. 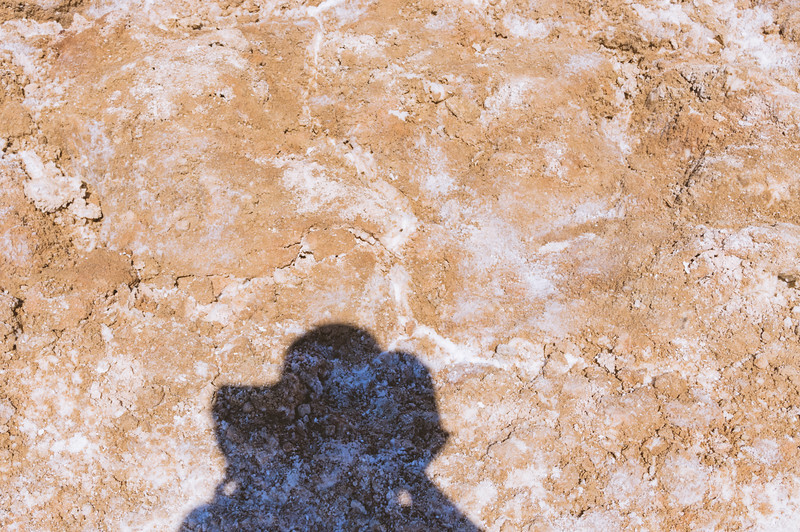 I was glad to have my sun hat and polarized lenses, as the sun created a blazing white light reflected off the salt basin. 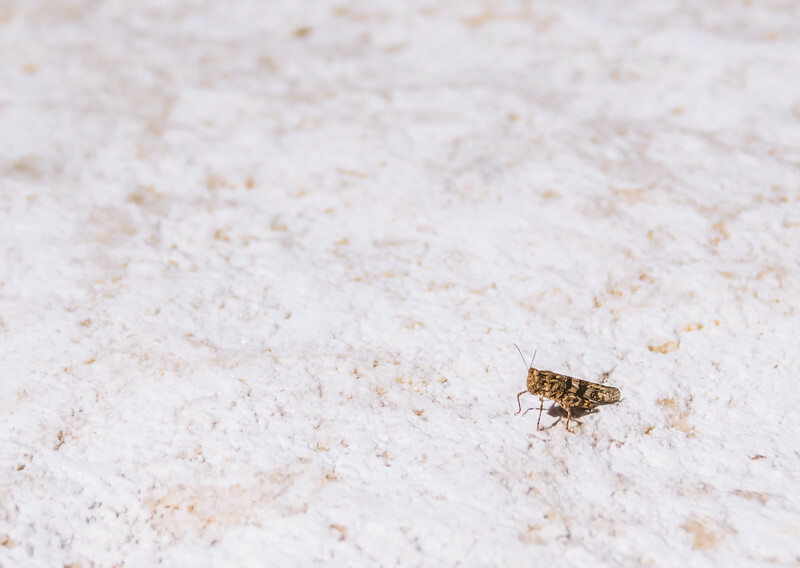 A tiny cricket caught my eye. I wondered how anything could live here. can you see the sea level sign? After wandering the basin for a while, we decided to find a quieter spot to explore. 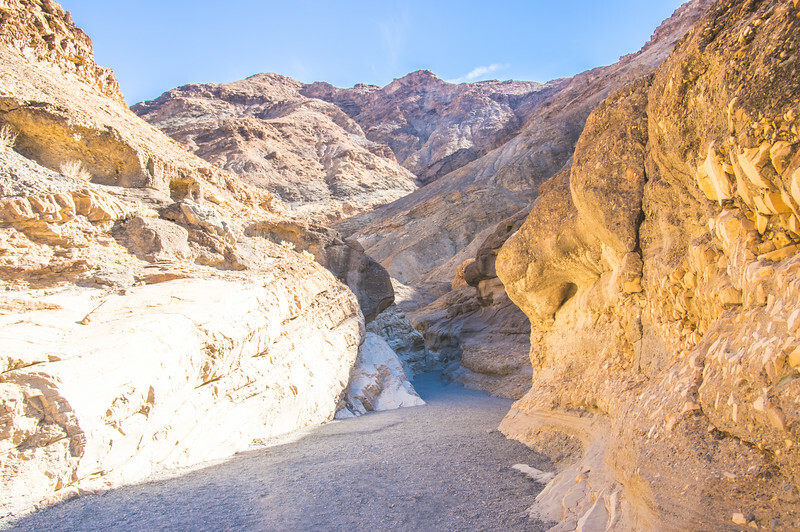 So we headed for the Natural Bridge Canyon trail just up the road from Badwater. The hike turned out to be our favorite of the trip. Two miles round trip proved to be quite the workout due to the elevation. 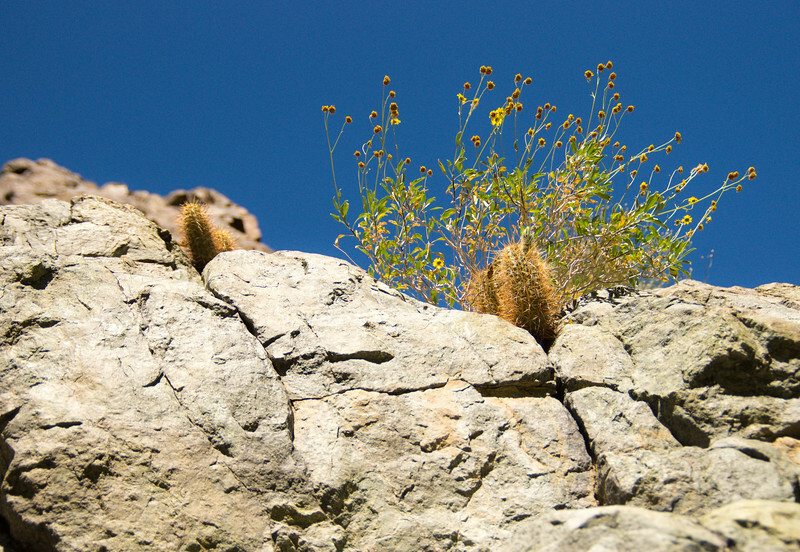 But we hardly noticed the climb while admiring the gorgeous rock formations. 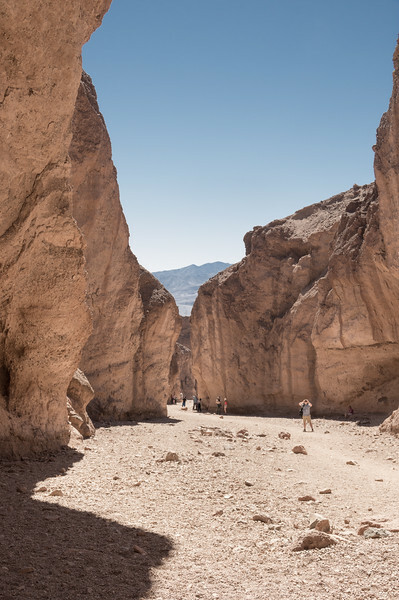 The cavernous path was shaded, a welcome relief from the violent rays we felt at Badwater. the best sun protection for your face! 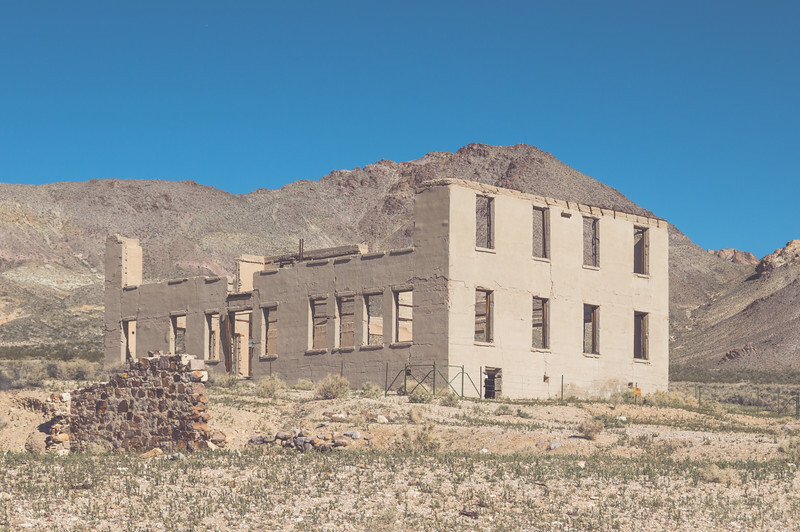 Tired and eager to spend some time in the air-conditioned car, we decided to head to our next stop, Rhyolite Ghost Town. 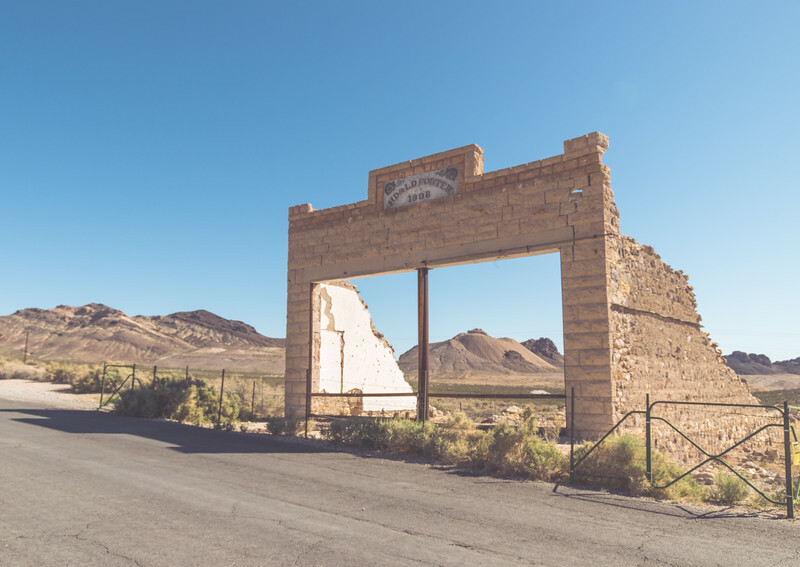 Crossing the border into Nevada, we ventured off the beaten path to find a goldmine of Wild West history. 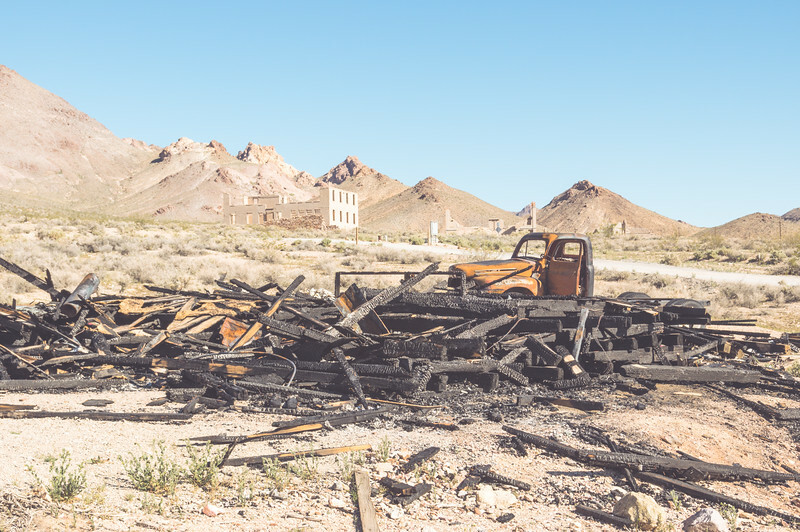 Established in 1904 by prospectors, Rhyolite was once a booming town with banks, schools, newspapers, and more. Now shadows are all that remain. 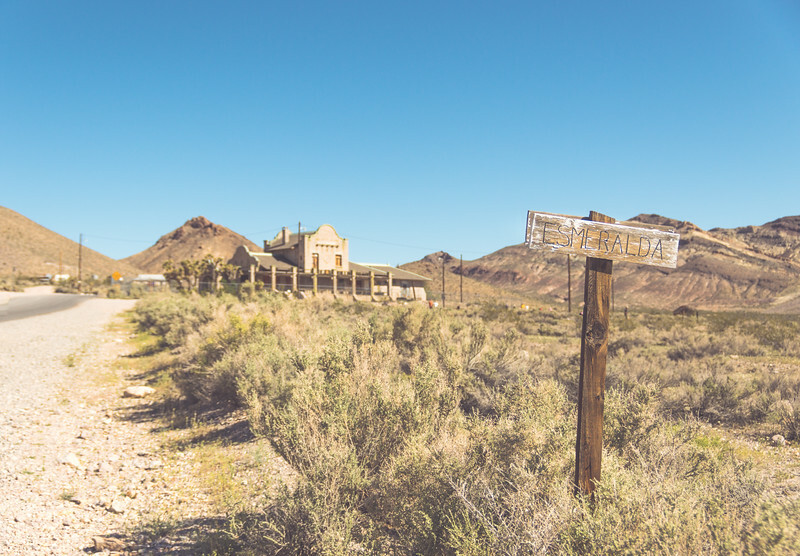 We explored the ghost town for a while, taking in the history and mystery of it all. 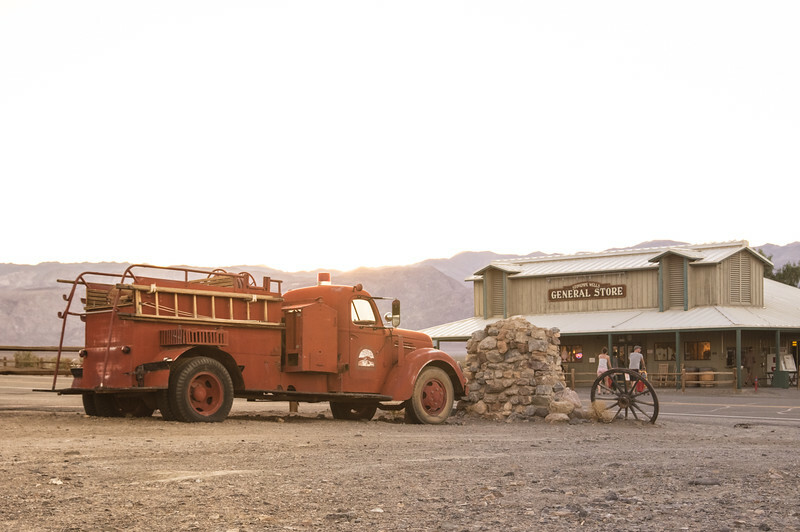 Death Valley ghost towns sure deliver! Back in the car, we decided to head further east into Nevada to find lunch. Luckily, we were able to find some decent grub at Mama Sara’s Taco shop, sadly no longer in business. We munched on authentic Mexican food while reading more about Rhyolite on our phones. Later, we stopped at Jedidiah’s Jerky for some fuel and the best beef jerky I’ve ever eaten. It was time to head back to our hotel to catch the red rock sunset. Families splashed in the pool as we admired the gorgeous colors of our Death Valley sunset from a bench just outside our room. Mesmerized by mother nature’s beauty, we sat silently watching the long shadows fall over the valley. Later we headed to Badwater Saloon, the other dining option at Stovepipe Wells Village Hotel, to sip cocktails with other travelers. Refreshed by the air conditioning, we ate dinner while watching the light fade through the dusty windows. We were waiting to star gaze. 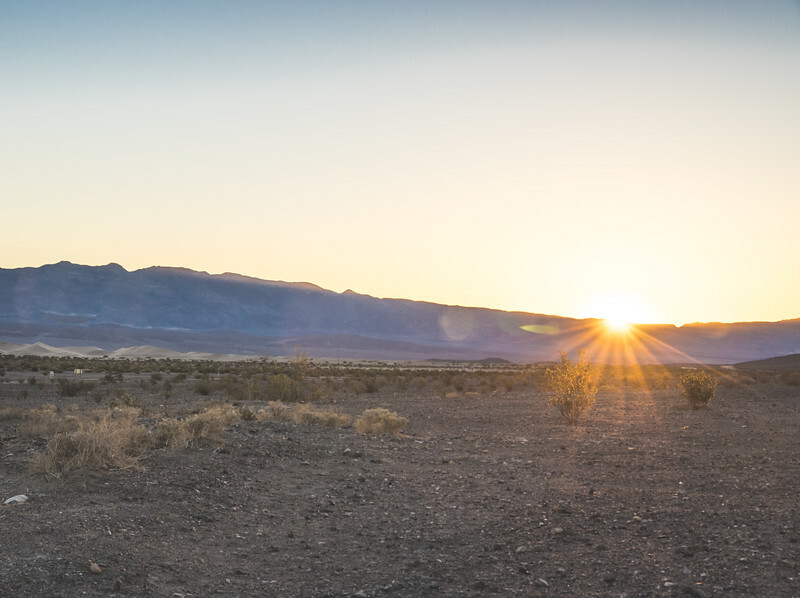 Our final morning in Death Valley began before dawn as we wrapped ourselves in blankets to watch the sunrise. I took in the majesty of it all over the rim of my coffee cup. After loading the car and snacking on our breakfast bars, we ventured to the front desk to check out and then to the filling station to top off the tank. Thirty minutes later I was laden with souvenirs for my friends and family. We set out for a final day of exploration. As we drove toward Zabriskie Point we passed the other Death Valley hotel, The Oasis at Death Valley. This huge property is home to a luxury hotel, campgrounds, and cabins. Once again, we let out a sigh of relief that we’d chosen the right property for our trip. The lush green lawn of the golf course made it clear they don’t care about water conservation despite the draught. 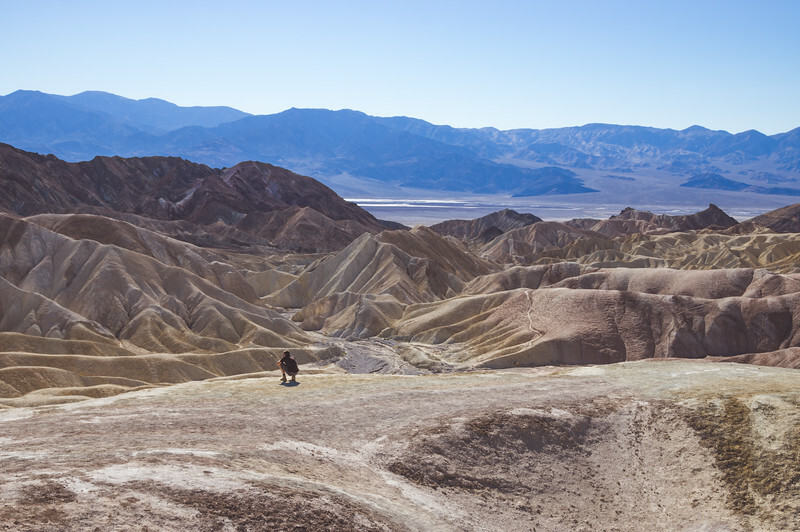 Several twists and turns later, we arrived at Zabriskie Point. The lunar-like landscape caught our eye immediately. 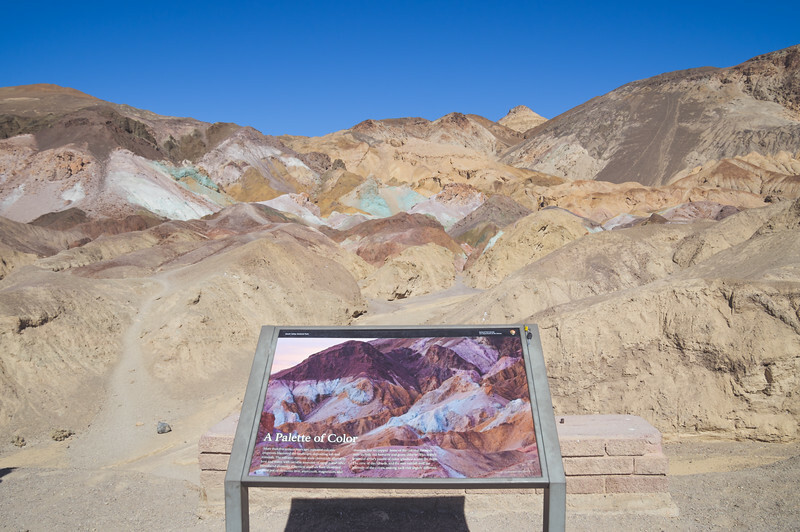 From the interpretive signs to the vista points, Zabriskie Point was by far the most modern Death Valley attraction we visited. 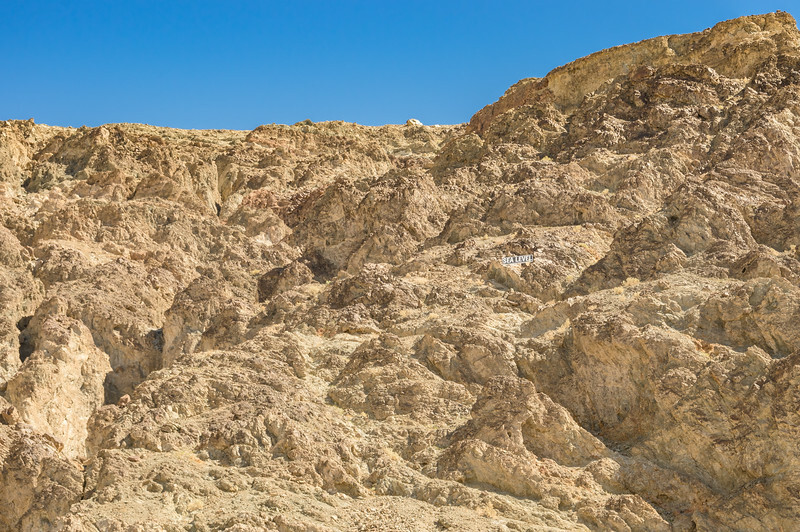 As we gazed out from the viewing deck, the textures and colors of the rock formations below beckoned to be photographed. We watched as a daredevil tourist decided to scale the rocks instead of staying on the deck. Luckily, he was unharmed. 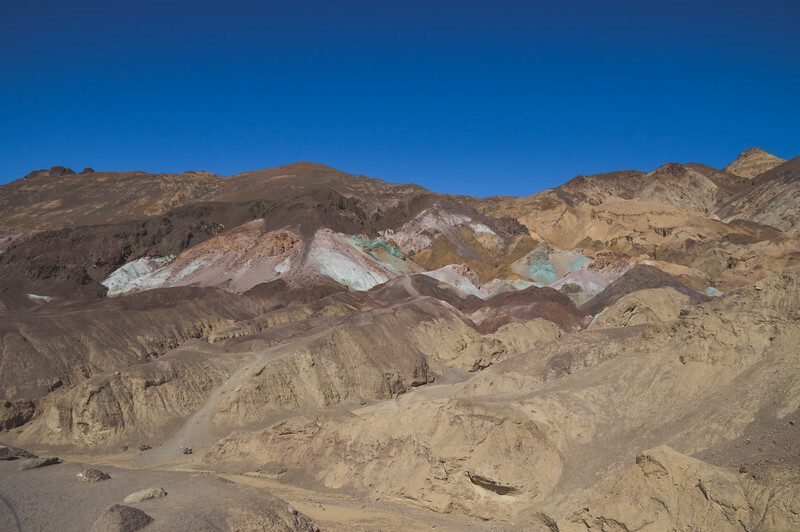 Our last stop on our Death Valley adventure would be a colorful one. Circling Artist’s Drive to see Artist’s Palette was something I had to do before we left. I’d seen images of the geologic formation and knew I wanted to try to capture the colors in a photo. The multi-colored rocks are the result of mineral deposits in the stone. Pinks, blues, and greens form the vibrant palette of colors that draw thousands of tourists each year. 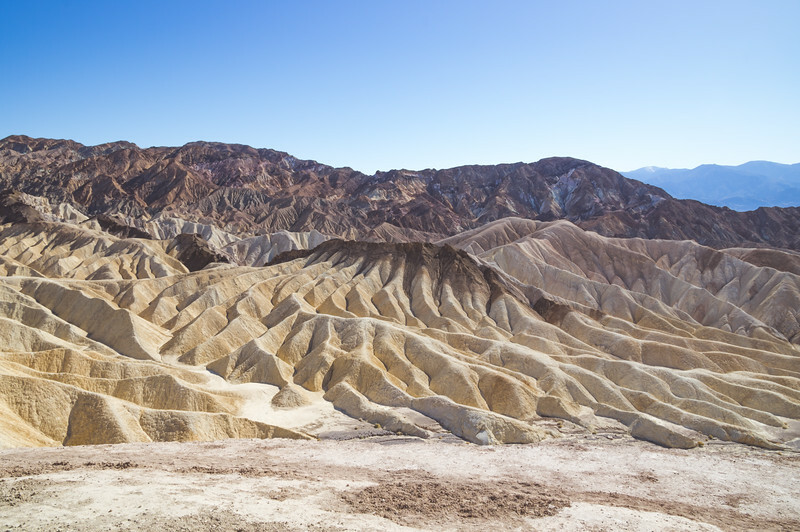 No trip to Death Valley is complete without seeing this marvelous miracle of nature. Eager to get on the road for the nearly 5-hour drive, we buckled in and headed home this time driving through Lone Pine, Sequoia National Forest, and Bakersfield. 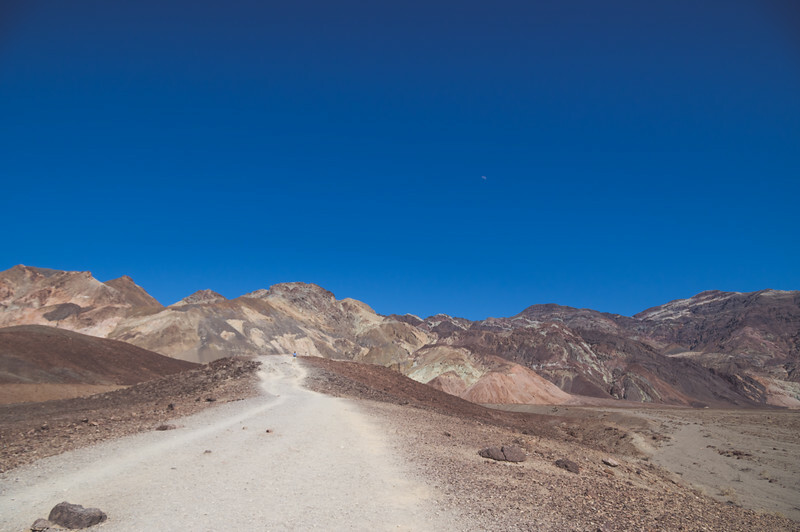 We left the surreal landscape of Death Valley in the rear-view mirror. But the time we spent there will forever be etched in our memory and in my images.